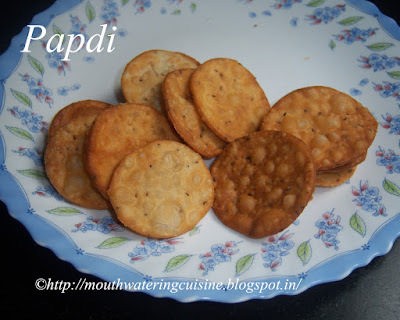 Papdi are made with all purpose flour. They are deep fried crisp papds. They are used in Papdi Chaat, Sev Puri and Bhel Puri. We can have them as a simple snack item also with a cup of tea in the evenings. Add all purpose flour, salt and ajwain seeds in a large bowl.Add little oil and mix well. This mixture become crumble texture. Add enough water to make smooth and pliable dough. Allow it to rest for 15 mins. Roll it into a 8" diameter thin disc, it should be neither too thin nor too thick. Pierce it with the fork to make small pores. With the help of any circular lid or cookie cutter cut it into small papads. Keep them aside. I did with a small plastic container, as my cookie cutter is very small. Heat enough oil in a kadai till it reaches fuming, check whether oil in hot enough or not by dropping small amount of dough. If it comes up sizzling, oil is ready. Slowly drop as many papds as can be fried. Fry them till they turn into brown color in the low flame only, they should not puff. Take them with the help of slotted ladle onto a kitchen paper. Do the same with all the papds. Once they are cooled store them in an air tight container. 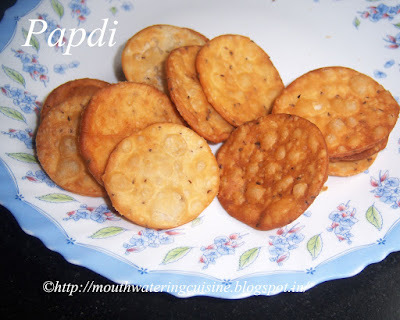 Serve papdis with tea or use them in Sev Puri, Bhel Puri or Papdi Chaat. I like these. Thanks for sharing the recipe Akka!